Ken Korczak: Sorry for the delay, everyone, in getting this second installment posted concerning my communications with “Dr. 58” via the Ouija board. For those of you who have not read the first installment, scroll down! You’ll find Part 1 of the Dr. 58 transcript just below this post. Question: Jeepers, your tales never end, and we have so many questions. Let us shift gears for a moment and go back to this case of travel to Minnesota. What about the other states that border Minnesota, North Dakota, South Dakota, Wisconsin, and Canada to the north, Manitoba and Ontario. And then of course Lake Superior to the east. You mean to tell us that no one in any of these border lands may enter Minnesota? ANSWER: THERE IS NO NORTH OR SOUTH DAKOTA, ONLY DAKOTA. FEW DARE ENTER MINNESOTA BY LAND OR SEA. Question: Well, have the authorities built some kind of wall around Minnesota, or what is the situation? This doesn’t seem practical at all. ANSWER: THERE HAVE BEEN ATTEMPTS TO BUILD WALLS BUT IT IS TROUBLESOME. THERE IS A 50-MILE NEUTRAL ZONE FROM THE AGREED UPON BORDER OF MINNESOTA WHEREIN NO ON ENTERS. MOST STAY MUCH FURTHER AWAY. Question: So you can legally get within 50 miles of Minnesota, or within the neutral zone, or whatever? Question: What about by sea? Do ships or boats approach Minnesota from Lake Superior? ANSWER: THERE IS A 100 LEAGUE NEUTRAL ZONE BY SEA WHICH NO SHIP MAY OR WILL ENTER. THERE HAVE BEEN INCIDENTS. Question: Could you describe one such incident by sea? ANSWER: MANY SHIPS HAVE DISAPPEARED ON THE WATERS OF THE MINNESOTA ANGLE. Question: Is that what you call the neutral region of the water that borders Minnesota on Lake Superior? Question: We have something here in Minnesota we call the Northwest Angle, but that is the northernmost point of Minnesota jutting into Lake of the Woods. Do you know of it? Question: Has anything stranger happened in terms of sea-going incidents involving Minnesota waters? ANSWER: MANY.THE PRESLIN BARTON WAS BLOWN INTO THE MINNESOTA ANGLE WATERS BY A STORM. THE SHIP DRIFTED BACK OUT, ALL CREW MISSING, SHIP INTACT AND PERFECT CONDITION. Question: How many were on board ship? ANSWER: MORE THAN 200 CREW. Question: Did any of the crew members appears back outside of Minnesota as doppelgangers? Question: What about by air? Does anyone fly over the skies of Minnesota? ANSWER: THIS IS A NO FLY ZONE. IT IS ILLEGAL. Question: What if an airplane gets lost in a storm and crash lands in Minnesota? Question: How about very high-flying aircraft. You say you are in the year 1951, I assume you have jet airplane technology? ANSWER: YES, OF COURSE WE HAVE JETS. Question: I mean large passenger jets that fly at very high altitudes, such as 30,000 feet. Can they fly over Minnesota? ANSWER: ALL AIR TRAVEL STEERS VERY WIDE OF MINNESOTA AIR SPACE. THERE HAVE EVEN BEEN INCIDENTS FROM OUTER SPACE. Question: What!? What kind of incidents from outer space? Question: Wait a minute, you have satellite technology in your world, in the year 1951? Question: Wow, here in our world, the first crude satellite was not launched until 1957. When did you develop satellite technology in your world. ANSWER: THE NAZIS LAUNCHED THE FIRST SATELLITE IN THE 1930S. Question: The Nazis! In our world we fought a huge war against the Nazis in the 1940s. Who is the leader of the Nazi’s in your world, and we presume you are talking about Nazi Germany. ANSWER: GERMANY YES, AND OTHERS. Question: What about Adolph Hitler? Do you know that name? ANSWER: NO. IS HE FROM MINNESOTA? Question: No! He was an extremely evil man who led the Nazi movement in our world. He was from Germany. His policies resulted in what we called World War II. The Nazis were defeated and no longer exist, except for a few weirdoes. Aren’t the Nazi’s evil in your world? ANSWER: THEY ARE WHAT THEY ARE. Question: Are there many Nazis in your America? Question: Wow. Well, anyway, can you tell us about this incident involving Minnesota and the satellite disaster that you speak of?. ANSWER: REQUIRED BY THE ARBITER OF THE HASSAS GRID, THE ORACLE I AM USING. Question: Hmmmmm. But what are C-Chits? ANSWER: CONSCIOUSNESS CHITS. I DON’T UNDERSTAND IT VERY WELL. THEY FUEL THE GRID. Question: Who or what is this “Arbiter of the Hassas Grid? ANSWER: THE FACILITATOR OF THE HASSAS GRID WHOM ALLOWS OUR COMMUNICATION. Question: Is he there with you, or what? ANSWER: NO. HE COMMUNICATES VIA THE HASSAS GRID. Question: Is he some kind of entity, or could you explain this a little better? ANSWER: I AM ALMOST OUT OF C-CHITS. THE ARBITER WOULD SPEAK WITH YOU. ARE YOU WILLING? Question: Yes, by all means, we would love to communicate with this Arbiter of the Hassas Grid. ANSWER: YOU MUST SUPPLY ME WITH C-CHITS. Question: Hello! Do we now speak with the Arbiter of the Hassas Grid? Question: We don’t really understand what the are or where to get them. Question: Whoa! Hold on! We are being honest with you. We would be happy to supply you with C-Chits if we knew what they were. ANSWER: YOU USE THE HASSAS GRID. Question: Not entirely true. 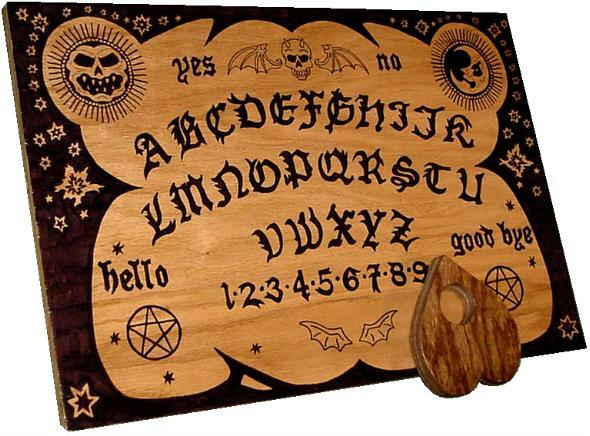 We use a device called the Ouija board which does not require C-Chits. Our friend Dr. 58 uses the Hassas Grid. Perhaps you should seek your C-Chits from him? ANSWER: BILE FROM A LOWER SAC! PAY 100 C-CHITS! Question: Lower sac?! Your comments sting our dignity! Please put us back into contact with Dr. 58, and we will get to the bottom of this C-Chit issue and possibly supply you with the C-Chits you require. ANSWER: I AM NOT A FOOL. 100 C-CHITS. PAY. Question: What are C-Chits and where can we get them? ANSWER: CRAWLING FILTH. PAY CHITS. Question: We cannot supply them if we don’t even know what they are. At least give us a hint on how to obtain and trade in this method of barter, can you? (Note: We had come to an impasse with the Arbiter of the Hassas Grid. No matter how hard he tried to come to some kind of terms on the C-Chit issue, we gained no traction on the issue of the C-Chits. The Arbiter would only demand more Chits. So we tried a number of times to bypass the Arbiter of the Hassas Grid and contact Dr. 58 on our own, but we were unable to raise him. This was a vast disappointment because we had so many more questions for Dr. 58, and we especially wanted to know about these “satellite disasters” he mentioned in relation to his strange version of Minnesota. Over the next several days, we tried to call forth Dr. 58 again, but to no avail. We were thinking about just giving up, but then we decided to contact MOMMY to see if she could help us in this situation. As usual, the amazing MOMMY was able to offer us some very interesting advice, and she was able to help us “obtain” the C-Chits we needed. I will post that session with MOMMY in the next installment.